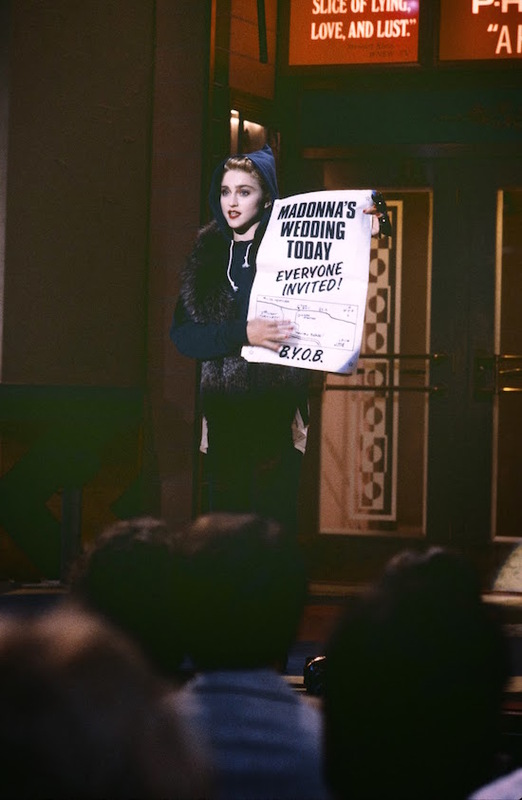 On October 11 1986, Madonna made a surprise appearance on NBC-TV’s Saturday Night Live, opening the show’s 12th season. It marked her second appearance on the program, having served as host for the premiere of the 11th season in 1985. 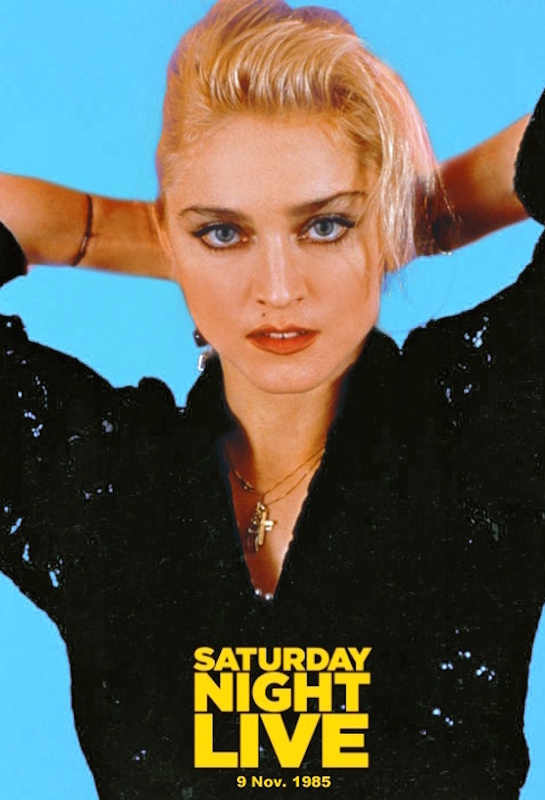 On November 9 1985, Madonna hosted the 1985-86 season premiere of NBC-TV’s Saturday Night Live. The musical guest was Simple Minds. Simple Minds performed Alive and Kicking and Satisfy Yourself. 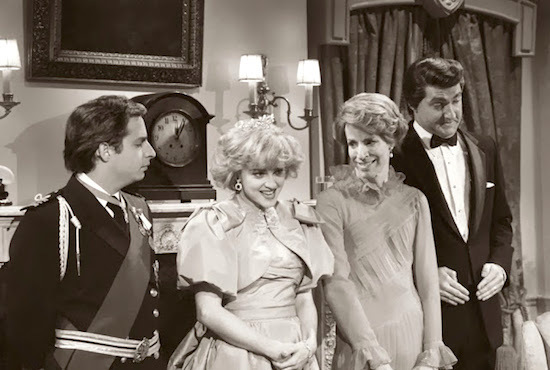 During the SNL skits, Madonna performed Take On Me, La Bamba and Lionel Richie’s Three Times A Lady. For the eleventh season of SNL, Lorne Michaels returned as executive producer after a five-year absence. Michaels wanted his own cast so the entire cast from the previous season was fired. Say what you will about Madonna’s acting chops, but the icon has always had our backs and never been afraid to push the envelope. Take, for example, her only hosting stint on Saturday Night Live back in 1985 when she was indisputably the most famous entertainer woman on the planet. In the sketch, which was clearly inspired by the anxiety and, in some cases, furor that surrounded an episode of Dynasty. Superstar actor Rock Hudson had joined the cast as a love interest to series regular Linda Evans. In one episode Hudson kissed Evans on the mouth. Not a big deal, you’re thinking but by the time the episode aired Hudson was revealed to be battling AIDS and had known at the time it was filmed but hadn’t disclosed the information to his costar. It was a different era, friends, an AIDS diagnosis was thought to be a death sentence and there were even tabloid reports that Evans had contracted the disease from a mere smooch. Evans, for the record, bore no grudge against the late superstar. 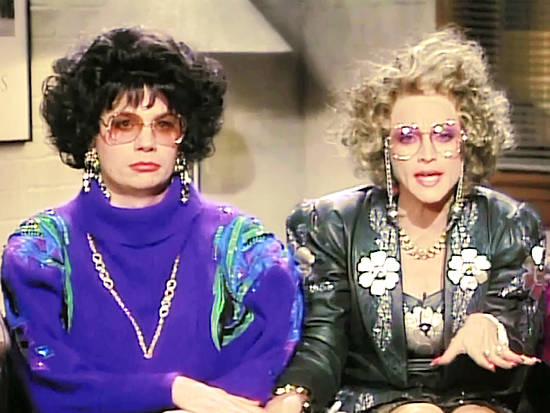 Anyway, in the skit titled Pinklisting, Madge dons a dark wig to resemble Evans’ other costar Joan Collins and a clipped British accent (a harbinger of things to come!) to play a TV actress unwilling to do scenes with a costar “she doesn’t know” due to her fear of AIDS. 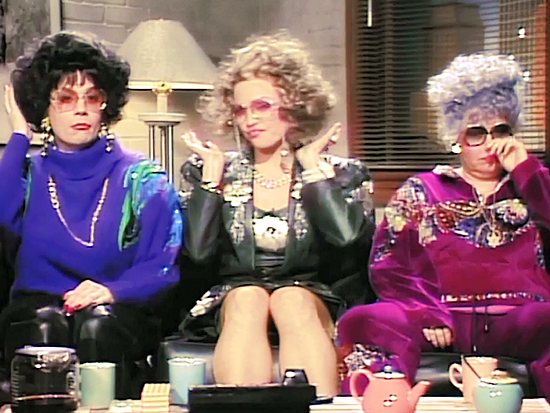 The joke, if it can be referred to as one, is that the costar is played by Terry Sweeney (still the only openly gay male SNL player), as a super-femme gay actor who tries to butch it up but he loses his cool when confronted by a snarky Judy-Liza headline. 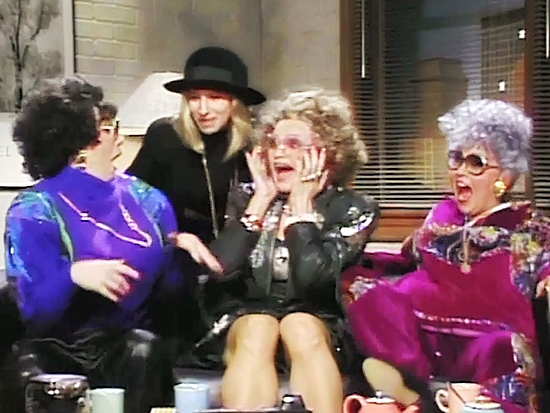 While the sketch isn’t exactly a rib-tickler it’s surprising in hindsight that it was a comic skit built around AIDS at a time when it was still considered a fatal disease, and broadcast in November 1985, less than a month after Hudson’s death. While that may seem insensitive, remember that this was the year Larry Kramer’s landmark AIDS-themed play The Normal Heart was first produced — and President Reagan hadn’t even uttered the word in public. 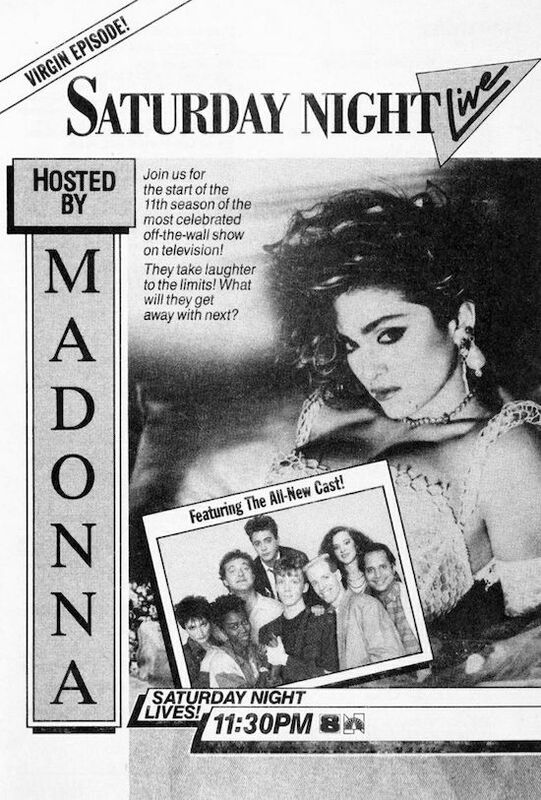 So let’s hear it again for Madonna, forever at the forefront of progress, bringing a public discourse on the disease into the homes of millions of TV viewers. 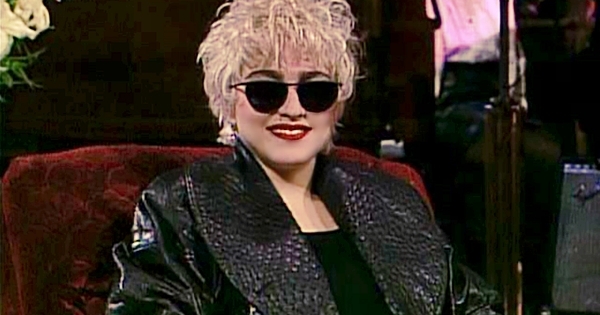 On January 16 1993, Madonna was musical guest on NBC-TV’s Saturday Night Live, performing Fever and Bad Girl. 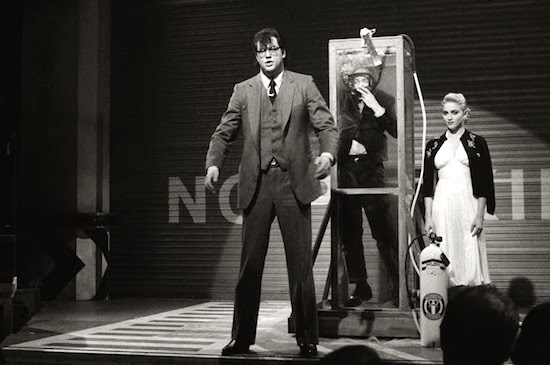 She also appeared in the show’s opening skit – a humorous homage to Marilyn Monroe – alongside the late comedians Phil Hartman and Jan Hooks. 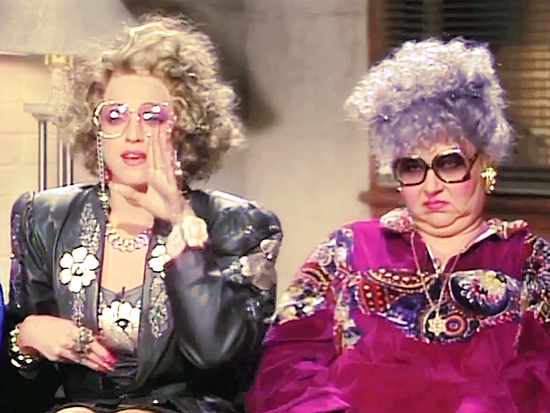 On October 4 2009, the media reported on the Saturday Night Live skit with Madonna and Lady Gaga from the night before. Gaga was the musical guest and the show host was Ryan Reynolds.